Text only version: A recent Heritage Open Weekend in Hull provided the opportunity to gain rare access to two private buildings in that city that have an interesting connection to Saltaire.The first visit was to the building in Park Street that had once been used to accommodate the Port of Hull Society’s Sailors’ Orphan Home & School. The Port of Hull Society was first founded in 1821 to provide welfare, moral guidance and eduction to seamen and their families. building, known as Thane House, had been the home, and school, run by the Rev. Henry Kemp. Following the purchase of the original building by the charity, an introduction to the work of the Port of Hull Society, by the Rev. Balgarnie, led Sir Titus Salt to help to organise the finance required to extend and convert the building into a fully functioning orphanage.This support was based on the importance of the merchant marine to the import and export trade of wool and cloth. Salt personally committed £5,000 to the cause. hand side.The front of the building has a simple classical appearance. The balcony above the main doorway is supported by paired doric columns. 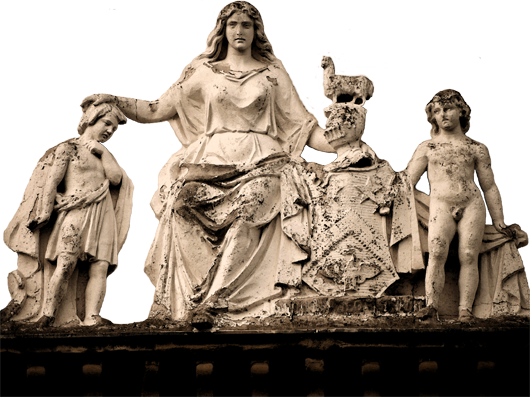 The central pediment contains a sculpture by William Day Keyworth of Hull and London, and shows ‘Charity’ surrounded by orphans, and holding the Salt arms; on either side of the group are various nautical elements. This too was paid for by Sir Titus. The Park Street home, which was predominantly a non-conformist institution, opened on the 7th August 1867. Following extensions in 1869, the building provided accommodation for 150 children. Later extensions saw an increase to 220 children. The qualifications for entry were for those children who had lost one or both parents, and whose fathers had connections to the merchant navy, the fishing fleet or the canal trade. The children came from an area of the east coast stretching from the Tees to East Anglia. Park Street closed as an orphanage in 1897, and the children moved to a new complex of homes named Newlands on Cottingham Road, on the outskirts of Hull. The memory of Sir Titus Salt still survived in this development, though, as one of the houses, designed to accommodate girls, was named after him. Following the transfer of the orphans, the Park Street building has been used for various educational purposes; including a a technical college, and at present, an art college. There was substantial collateral damage to the building due to bombing in this area during the war; and the various uses to which the building has been put over the years required extensive internal changes. As a result, there is little to see inside the building relating to its days as an orphanage, with the possible exception of what may be some original staircase wrought iron balusters. However, access to the rear yard shows some original features of the old orphanage. The other building I went to see is one of the few surviving churches in Hull designed by Henry Lockwood, of Lockwood & Mawson fame. Lockwood moved to Hull to set up in business as an architect in 1834, and had offices in Dock Street, Hull. During his time in Hull he built several churches, including a Methodist chapel, and an Independent Congregationalist chapel, both built in the classical style; and two Anglican churches: St Marks and St Stephens, both of which were in the gothic style. The Methodist chapel was destroyed by fire in 1907. Both of the Anglican churces, and the Independent chapel were damaged by bombing in the war and were later demolished. Interestingly, St Stephens stood within sight of the orphanage in Park Street. One of Lockwood’s first religious commissions in Hull, however, was for a new chapel for Trinity House, a charitable institution that controlled navigation on the River Humber, and still trains young people for the merchant navy. This private chapel is within the precincts of the Trinity House complex, though it can be seen through the impressive gateway in Princess Dock Street. Lockwood was paid £40 for the plans, though the building cost £3,500 and took four years to build. The chapel opened in 1842. It is designed in a Classical revival style. The buildings on either side of the lane leading to the chapel are classrooms and houses for the school. The west front, facing towards Princess Dock Street, is quite plain in appearance. It has a rusticated ground floor and a central corniced portico. The main entrance is flanked by Greek pilasters. Above it is a Diocletian window, with moulded surround and keystone. The interior of the chapel is in a square, ‘Greek Cross’ format. The original oak box pews and pulpit are both by Lockwood. Around the walls are a series of Corinthian pilasters of veined white marble, with nautical elements within the scroll work. At the east end is a coffered apse, framed by Corinthian pilasters. The altar is from the original 18th century former chapel. The stained glass window, which dates from 1840, is by Mr Stangroom. The central section of the ceiling consists of a ribbed groined vault. From which is suspended a Roman style light fitting. Natural light is provided by Diocletian windows to the north, south and west. The main feature at the west end is a coffered barrel vault, below which is a panelled wooden gallery supported by two square pillars. The east front, which is more impressive than the west front, is in an enclosed court-yard. It has four giant Greek Corinthian pilasters, above which is an entablature and pediment. It also noticable that the external simplicity, particularly at the west end, contrasts with the more decorative Corinthian style used inside the chapel. Henry Lockwood designed many buildings during his time in the East Riding. His work included private houses, police stations, commericial buildings, churces and chapels in Beverley and commissions at Burton Constable and Sewerby Hall in Bridilington. Lockwood moved from Hull to Bradford in 1850, following the formation of his famous partnership with William Mawson.